Now, let's talk about Lip Ice's newest product, Water Colour Balm. This is a buttery tinted lip balm. It glides smoothly on the lips. It also leaves my lips well moisturized. I was really surprised on how well it softened my lips immediately after application. It contains shimmers that makes it look more of a gloss than a balm. These Water Colour Lip Balms are formulated with Super Hyaluronic Acid to provide and retain moisture, and helps plump up the lips. They’re enriched with Ceramide to help hold the skin cells, collagen, and elastin together for firmer lips. Lastly, they contain Vitamin E and Maxilip™—the latest anti-aging ingredient to help reduce fine lines and keep lips soft and supple. I got the shade Dancing Pink which is a nice baby pink color with shimmers. The shade looks so light on my dark lips so, I do not use it on its own. I do love pairing it with my lip stains and matte lipstick. Will I buy these balms again? Definitely. I will be buying a darker shade of the Lip Ice Water Colour Balm in Rock n Pink. Have you tried Lip Ice products? What are your faves? 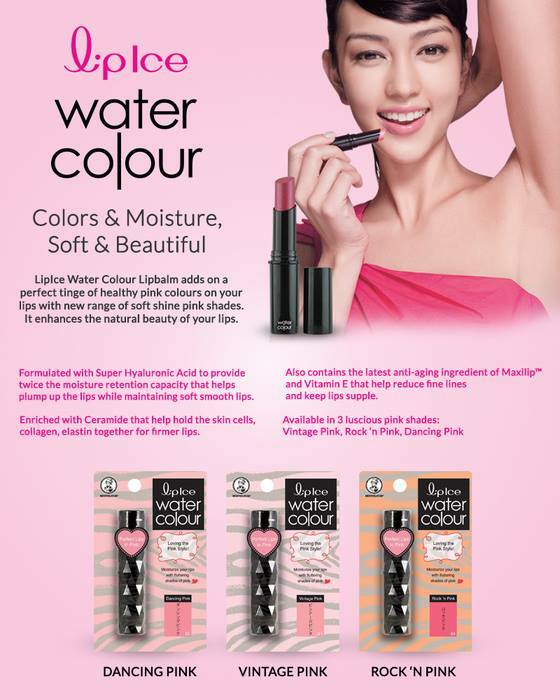 Lip Ice Products are available at Watsons and other leading department stores. How much does the lipice Watercolour go for? I adore buttery lipbalms/sticks like Revlon lip butters. I live for full-on gloss, moisture, and color. <3 Wish lip ice had more available colors though.